If you ever live at the shore, one thing that crops up in 13-year cycles is what they call Red Tide. The traditional explanation I have always heard is that is caused by farming and the runoff of their pesticides that contaminate the water. I use to hear that in New Jersey and the same thing in Florida. It seems to be linked to the same people who promote Global Warming who want us to starve and stop driving to work. I would ask, where is the runoff from farmers when there are none in this area? It would go in one ear and out the other. It seemed to be more of an urban legend that has perpetuated by telling the same lie so many times it becomes just accepted truth. To say the least, I was shocked to actually see an article in the local newspaper, Tampa Bay Times, explaining the issue and they were not blaming the farmers. There are scientists who are actually trying to figure out what causes a Red Tide and the research is untainted because they haven’t figured out a theory governments can use to justify more taxes. They are studying how the Earth is actually much more dynamic and globally connected than anyone has ever dared to image previously. The subject of study is how the Sahara Desert may be to blame for environmental changes. It turns out that the Sahara Desert results in massive dust storms that are carried in the winds just as volcanic ash in the Pacific can create volcanic winters in New York City. The dust storms from the Sahara actually provide a vital nutrient source that fertilizes the rain forests in South America. They have been collecting the dust to track its movements all the way here in Florida. What they have uncovered is that for about 100 days from spring through the fall, the winds in Africa pick up tiny dust particles from the desert and propel them high into the air and then carry them thousands of miles across the Atlantic Ocean. They travel up to 3 miles above the surface of the water. They have been landing in the Caribbean Sea and the Gulf of Mexico for millions of years. These dust storms have contributed to building Caribbean beaches and they have fed phytoplankton. They will even create beautiful sunsets off in Texas. Scientists are still trying to understand the extremely complex ecosystem of the planet. They are not sure yet why patches of Red Tide algae suddenly multiply by the millions and turn the water the color of rust killing fish. These Red Tide blooms will actually begin typically 10 to 40 miles offshore. The currents and the wind move then closer to shore. The origin appears to be these clouds of dust that form and travel the same course as hurricanes. With satellite images, they can now actually visually see these massive dust storms originating in Africa. Red Tide also takes place in the Pacific. What is interesting is how in California they have been using Red Tide claiming this is proof of Global Warming. The argument has been that the algae blooms during the period of warm water and thus instead of farmers, they blame people driving to work. There, the Pacific Ocean undergoes what is called upwelling. Upwelling is the process when winds carry deep, cold nutrient-rich water to the surface of the ocean. This process of upwelling mixes with ocean currents making for an area rich in microbial and organismal diversity. There are three currents off the Pacific coast that impact this mixing that takes place. The first is the California Current (CC), which carries cold, oxygen and nutrient-rich water southward along the Pacific coast. The second is the California Undercurrent (UC), which originates from the Eastern Pacific near the equator and brings warm, saline, phosphate and oxygen-poor water northward. The final current is the Davidson Current (DC), which occurs in the fall and winter bringing current northward. 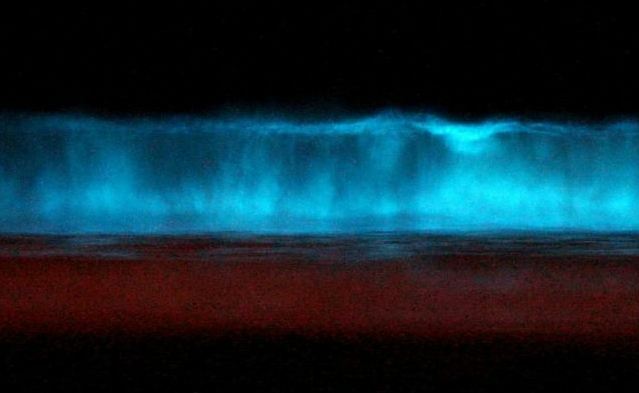 The Red Tide that hits San Diego produced night glowing algae that is beautiful. 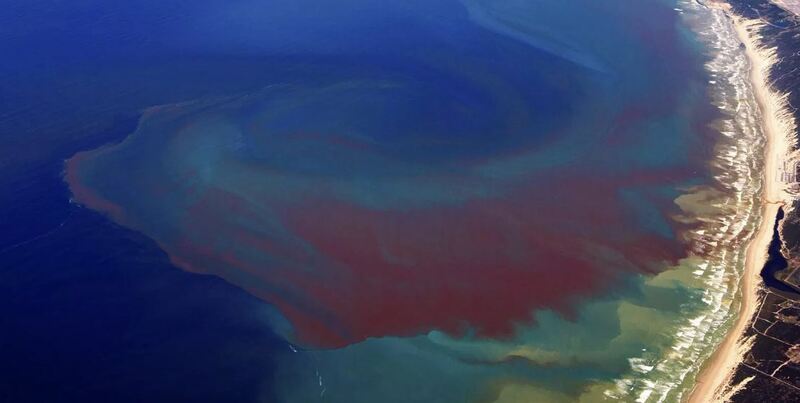 The cause of this unusual phenomenon was a tiny organism called Lingulodinium polyedrum which is a type of algae which is emerging cyclically but is also a Red Tide. A short time later, in the city of Merida, for several days, especially in the evenings when the wind blows from the sea, came a foul odor that at times could barely be tolerated, as it penetrated all parts. No one knew the cause of the odor until a ship from Spain encountered a mountain of dead fish near the coast. Dead fish were heaped on shore, and this is where the foul odor emanated. For several days now multitudes of dead fish have washed onto the beaches of Veracruz and some violent deaths have occurred to which were attributed to the sale of these fish. The governor decreed a ban on the sale of all types of fish from rivers and those fish from the sea could not be sold until the proper authorities inspected them. This same epidemic of dead fish occurred repeatedly in this same port. Personally, if I can find accounts of the same phenomenon centuries before fertilizers and driving to work, I think it is safe to presume we may just be dealing with a natural phenomenon that is more supported by the satellite images of dust storms that follow the same path as hurricanes. In this case, we may not even be dealing with something that is caused by climate change. I ran some preliminary Red Tide events into the computer and out popped the 8.6-year frequency and particularly intense period on 13-year cycles. Just interesting to say the least. « 2016-18 Big Chill – NASA Confirms Global Cooling?